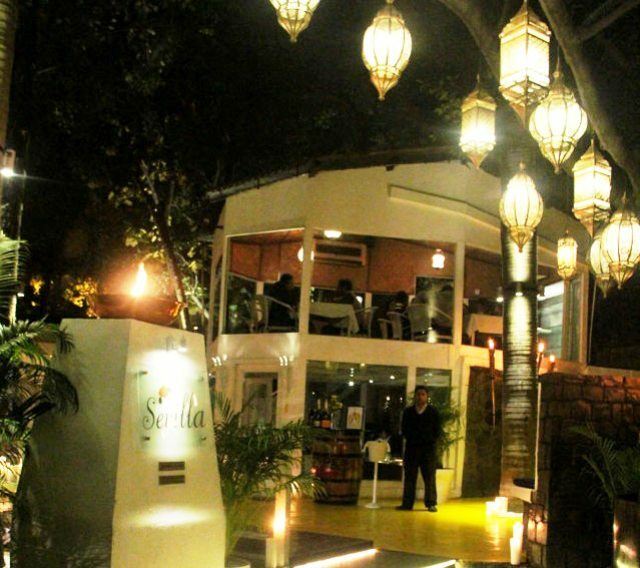 A restaurant that’s voted the best Spanish in the fine-dine category by one of Indian’s leading F&B guide and I haven’t been there yet, that’s like more than a reason to place it on the top of our must do list of restaurants this season. 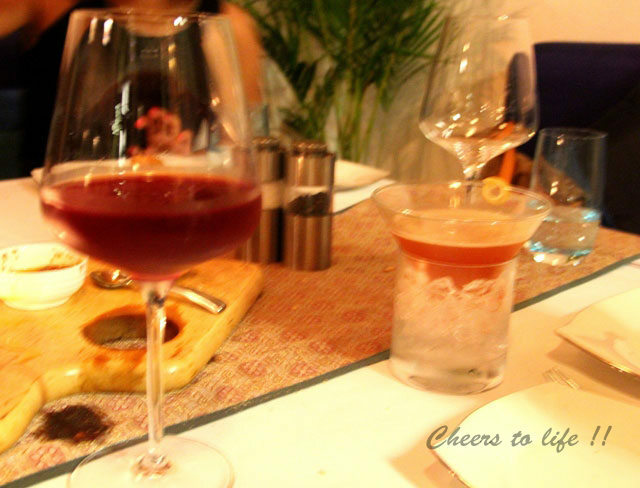 All it took was two of our dearest foodie friends before we dropped into this modish restaurant for a weekend dinner. An array of Moroccan style chandeliers at the entrance led us into the courtyard of this part open air restaurant. It immediately struck us as the place you’d like to come for a special celebration with some Spanish romance floating through this ‘open only for dinner’ restaurant. The serenity of white drapes, sparkle of a thousand tiny lights and candles, gazebo seating arrangements adds a luxurious charisma to the ambiance. 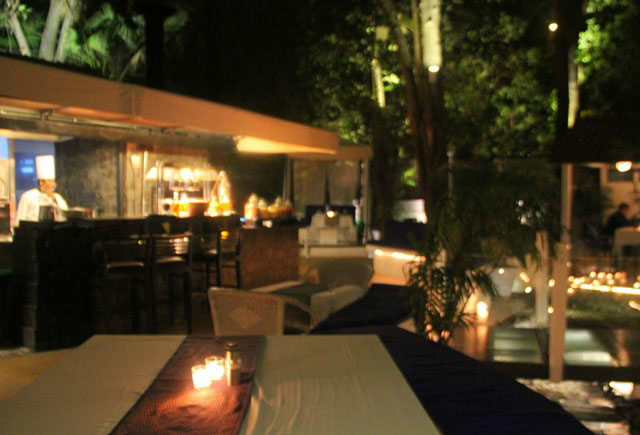 Just a couple of tables are spread out in the open under the lush greens of tall trees but you need to be really lucky to find an open air table unless you book much in advance. So we settled for an indoor area created within glass paneled gazebos. Quite a turn off for a fine dining restaurant, especially for one located within a five star property. They are either too busy catering the who’s who of the city or generally careless for every request may need a repeated reminder. But if you can manage to grab the attention of the maître d the things would run smother and the food would be served in style. To give your evening a go, Id’s say start off with some great Spanish wines or a choice of Sangria and settle down to scan the menu carefully. So one can either choose go by the pre- set Connoisseur’s Menu or choose Ala carte, we decided to stick with the later. 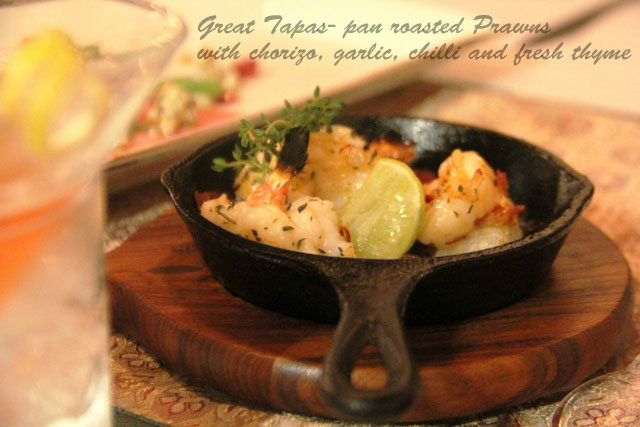 The menu is an eclectic mix of the classic and modern and swings between flavours from Spain, Italy, Morocco and the entire Mediterranean with quite a number of interesting dishes on the list. To kick start one must choose from the extensive list of Tapas, we ordered some cold cut ham , the Pata Negra (Iberian ham), alongside a Pan roasted prawns with chorizo, garlic, chilli and fresh thyme, and fried mini oysters with chilli oil and a cheese filled dates and ham dish (the name of which I can’t recall). 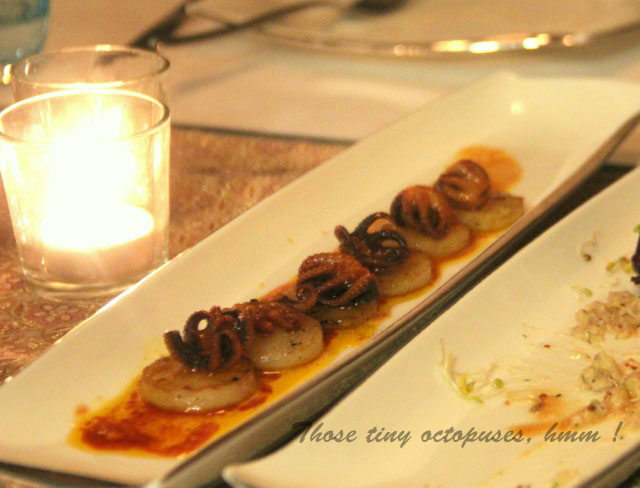 The petite portions arrived in style, almost an eye candy but not everything that was served could tickle the taste buds. 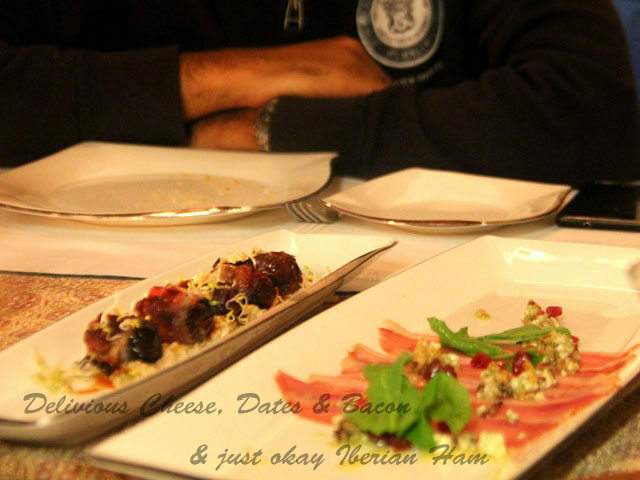 The Cheese dates with ham and the Pan roasted prawns were delicious, but the other two not quite impressive with their unnecessary add on of mung bean sprouts that made the ham topping taste more like a chaat masala. Well, I love the experiment in the kitchen but the word restrain and stick to basic often saves us from going over the top. 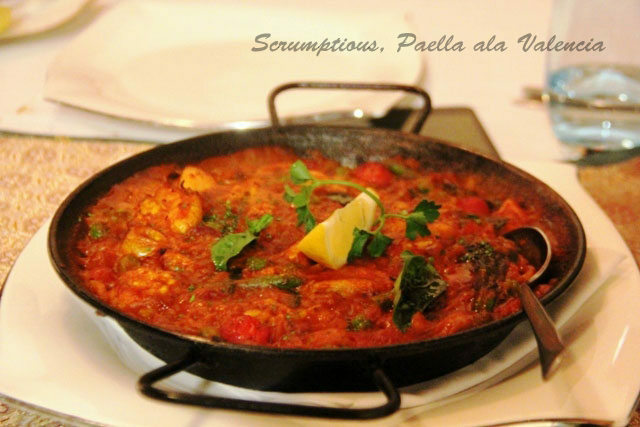 Moving to the mains we called for the classic Paella ala Valencia or the Mix meat paella as they call it, a homemade cheese and sundried tomato saffron ravioli with garlic butter and fresh basil and a portion of Grilled Sea Cod with watermelon cannelloni and a tangy dressing. The mains were much satisfying with the cod being outstanding. I got to praise the paella too, it was spicy, flavourful, perfect consistency, balanced and wholesome. The desserts we decided to let go of, mostly due to the bulging waistline that’s been making us a little conscious these days. But, the dessert menu is difficult to resist I must say, and yet I left it to be explored on my next visit. Yes, I would go back there someday, when I’ve got some elite guests to entertain and survive on the Pan fried Prawn Tapas, Paella Valencia and the Grilled cod saving room for exploring the desserts. I’d also recommend Sevilla as the must go to place with your girl, over a romantic dinner on a cool evening, away from the urban cacophony right in the heart of the city. For otherwise, the place is expensive, we paid in excess of Rs 11,000 for the above meal for 4 without any dessert and only one cocktail each. 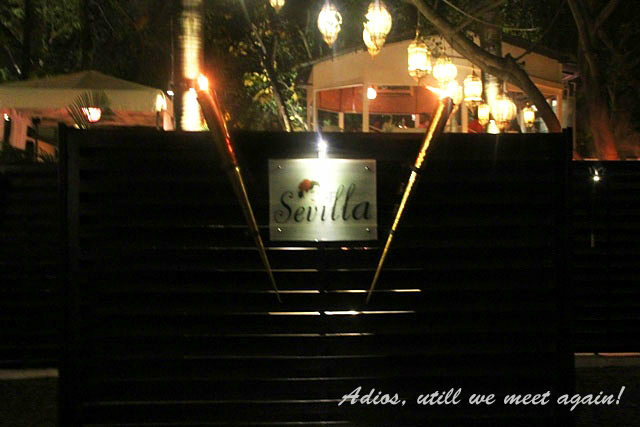 Review: Sevilla, Delhi (Fine dining- Spanish, Mediterranean).Read on for the latest, detailed review with pictures. 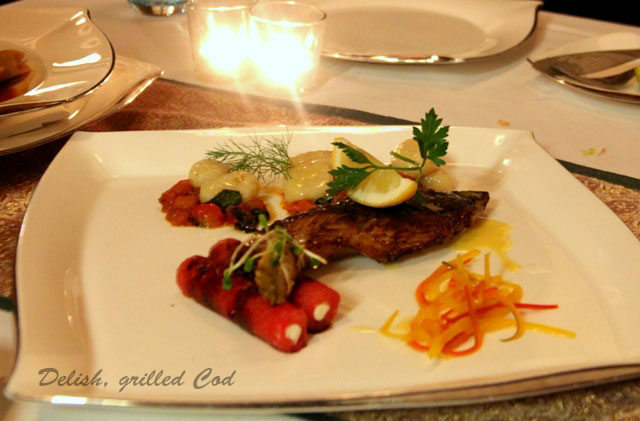 A romantic, fine dining restaurant in the heart of the Capital. If your thinking for Spanish food tonight? 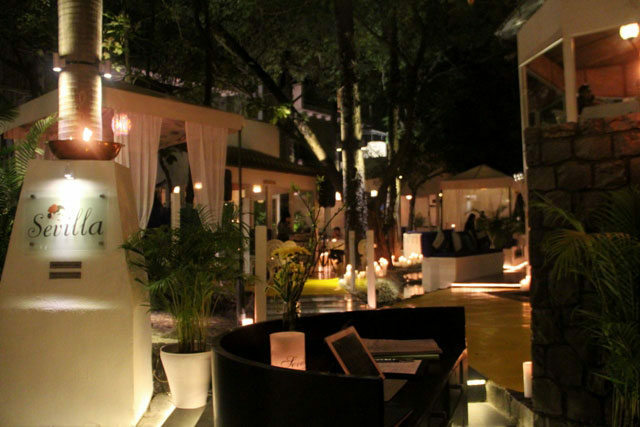 Then the best place for you is Sevilla in delhi. 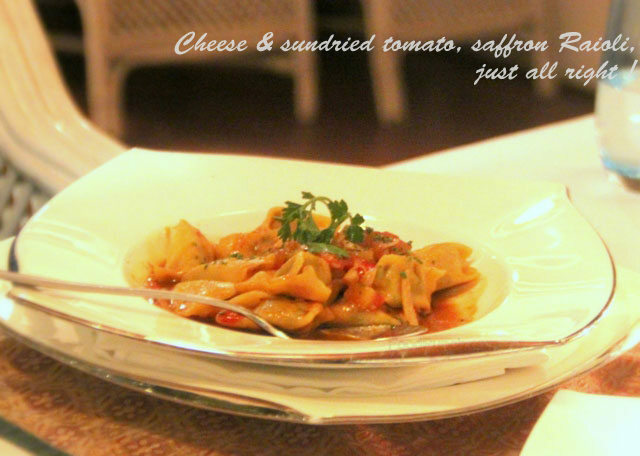 It is the best restaurant in delhi for you……….